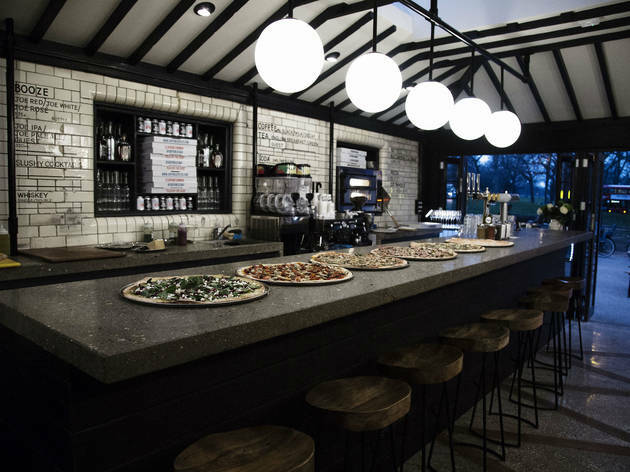 By-the-slice pizza in a former Clapham loo. Ready for some hipster box-ticking? Yes? Okay, let’s go. 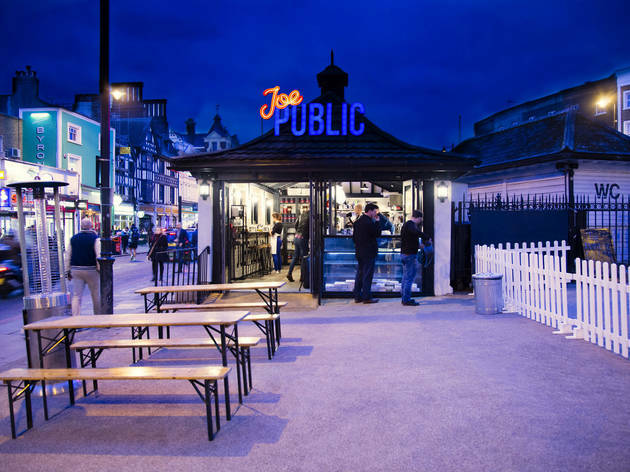 Joe Public is an artisanal fast-food joint (tick), in a stools-only space (tick), that happens to be a former public loo (tickety-tick-tick)! Inside, there are two counters, one on the ‘wall side’, the other at the bar (sit here, there’s more legroom). I could go on: drinks menus scrawled on the Victorian white-tiled walls, cutlery kept in cleaned-up tins of chopped tomatoes, its ‘own brand’ Joe Public IPA. You get the idea. 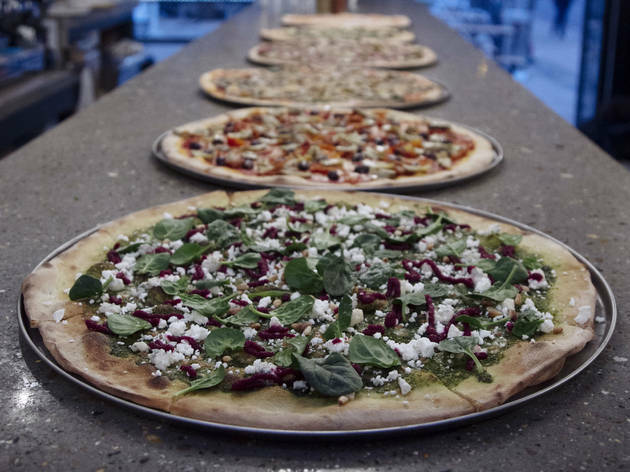 It’s a US-style pizza joint and what comes out of the ovens will be a 20-inch pie. Twenty inches, incidentally, is huge. Forget bigger than a baby’s arm; we’re talking bigger than a grown-up’s arm. Which is precisely why you order them by the single slice: two to three is plenty. Toppings have a Stateside vibe: chilli-flecked slivers of pepperoni; fatty fennel-spiced sausage with mushroom and caramelised leeks; a classic margherita (a touch over-enthusiastic on the oregano, but generously cheesy). 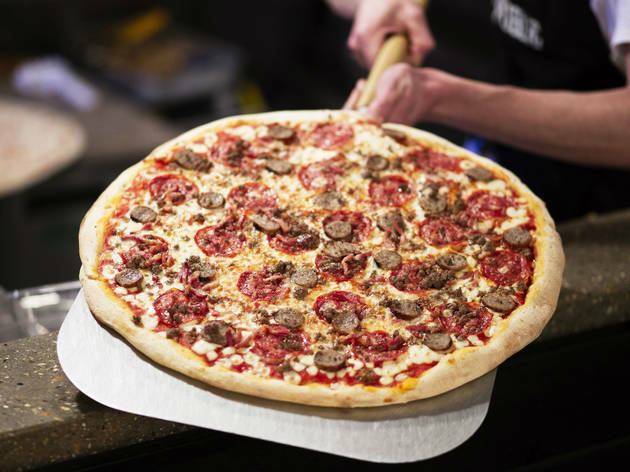 Bases are crunchy and thin and crispy – remember, this is a US-style joint – so if you’re a pizza purist in search of that unique Neapolitan-style crusty-plus-chewy dough, you’ll have to look elsewhere. 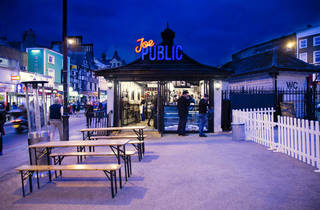 Joe Public will be a huge hit with the takeaway crowd (there are seats for 30 outside, plus a hatch, open till midnight, where you can order ‘to go’, and they even pump electroswing through speakers so you can sway while you wait). But at only £4 or £4.50 a slice, it makes a sit-down meal – albeit a high-speed one, best for a quick pit-stop – an absolute steal. Dinner for two with drinks and service: around £20. 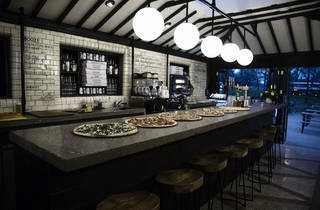 Their one & only pizza shop across London, is located here, in Clapham Common, just next to the tube station. Rich flavoured pizza, with yummy dough and unique ingredient combinations. Amazing amazing pizza!! I'm so grateful I can get this delivered to my house. In summer you can sit outside and people watch. The quality of ingredients and pizza flavours are wonderful. In store you only need a slice(they are massive). I'm picky as hell on my pizza as a native NYer and this place hit my high bar. I got a slice of the TSB and a slice of the wild mushrooms for takeaway. Slightly sour dough that was not too thin, and not too thick, lots of toppings for each kind of pizza and decent portions all made me happy. 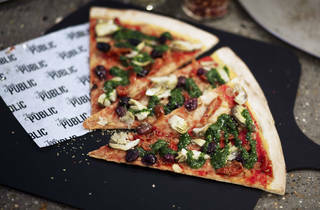 Whilst £4 for a slice makes this NYer blanch a bit, the hearty flavours were worth it. 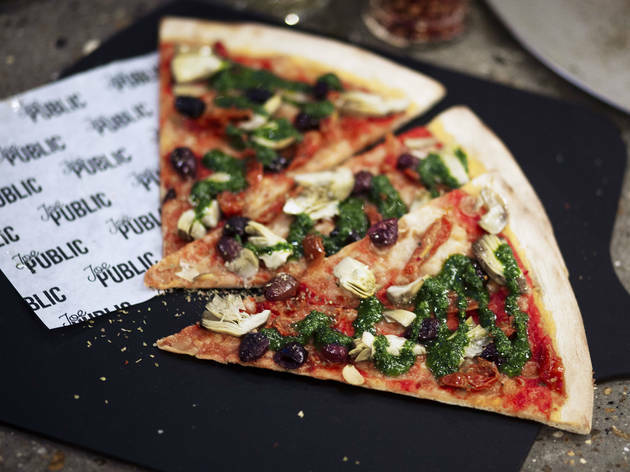 Amazing pizza - with slightly more interesting flavours than your average pizza joint. Great in the summer as you can sit outside and enjoy the weather. Pizza and wine on tap! Who could ask for anything more. 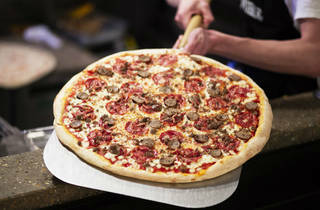 Great staff, great pizza. It's in a bloody loo. Original as hell. Something a bit different - street side eating in Clapham, low prices, surprisingly good wine for the price / setup. Pizza is excellent, nice music and atmosphere in addition to this the manger is very sweet and easy to chat to. Sometimes you hear about a place through friends and you trust their judgement and sometimes you walk past it in the street and literally have to stop yourself from doubling back and ducking in for lunch because err, it’s 8am and ‘I’m sorry I’m late for work but I stopped and ate an entire 20” pizza on the way over’ is probably not the best thing to say to your boss on Monday morning. Fine on a Thursday FYI. Joe Public falls squarely into the latter camp. 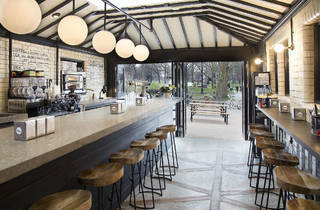 I’m not a Clapham native so finding myself there for work over the past fortnight has given me plenty of time to peruse the neighbourhood for sweet spots to add to my ever expanding list of London must-eats. 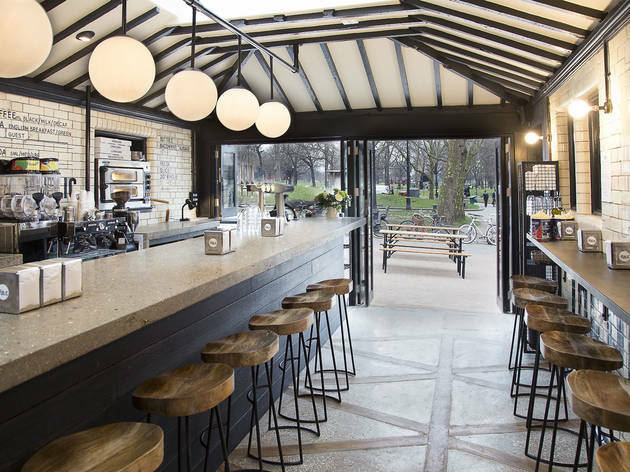 Word to all future restaurant owners of the capital here: stepping out of the tube to find I have to exert only as much energy as it takes to swivel to the left before I can be sat at a picnic bench ordering a slice & a beer is a guaranteed way to make me like you. Making admirable work of a former public convenience with wooden stools, white subway tiles, cutlery in recycled tinned tomato cans and old skool diner napkin dispensers make this is as close to the sort of place you could imagine sharing a pizza stateside with Ross, Joey & Chandler (‘And then I kissed her’, ‘Tongue?’, ‘Yeah’, ‘Cool’) as I think you’ll get in London. Serving California style pizzas – lots of toppings on favourite-child-of-the-bread-world sourdough bases – that can be bought by the slice or as a BFG snack sized 20” version, the menu boasts gluten free versions of most bases and an array of ingredients to sit atop them from sausage & bacon to purple potato & artichoke, although given its supposed West Coast inspiration, I was surprised not to see avocado on anything. I’m a sucker for anything vaguely Middle Eastern when it comes to eating out so a Braised Lamb, Cumin Aubergine, Goats Cheese & Sweet Potato Base convinced me to Deliveroo my first piece of Joe’s rather than sit in as this flavour variant wasn’t an option available in house. The base was full of sweet potato flavour which I loved and it was hot & crispy without being overly stodgy or greasy so full points for a super speedy delivery. Aubergine chunks were plentiful and nicely spiced but sadly the generous hand that dealt out those bad boys didn’t appear to want to do the same for the lamb which was a tad sparse. Did it rock my pizza world? Not really and I’m not wholly convinced that this won't end up being a place that runs on ‘novelty factor’ rather than the best pizzas this side of Naples however if you find yourself stumbling out of a nearby pub next Friday night, hungry for something to soak up those BOGOF Aperol Spritzes that taste so good in the sunshine, then I’m pretty sure the neon sign and cheap & cheerful value of Joe’s will be most welcome. I've now been here for both pizza and breakfast too. It has a laid back atmosphere which is welcoming and great if you're hungover/feeling anti-social. 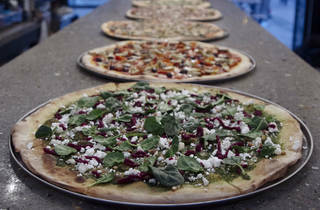 The pizzas are the best and they have some really creative combinations, sweet potato base is a particular favourite. Breakfast is still fairly quiet as it's new but the coffee is good and they have great sausage baps, also useful if hungover. All in all a welcome addition to the area.